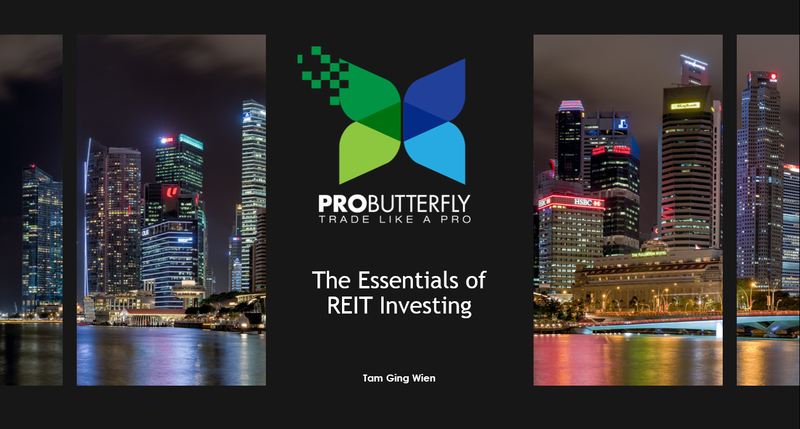 All examples and stocks quoted here in this article and on the ProButterflyTM and REITScreenerTM site are for learning purposes; it does NOT constitute financial advice or a Buy/Sell recommendation. Contents are reflective of personal views and readers are responsible for their own investments and are advised to perform their own independent due diligence and take into account their own financial situation. If in any doubt about the investment action you should take, you should consult a professional certified financial adviser. 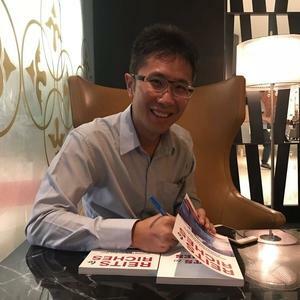 In early January 2019, SPH REIT released its Q1-2019 results – its DPU turned in flattish at 1.34c same as a year ago. However, the rental reversion rate turn out to be a positive surprise. 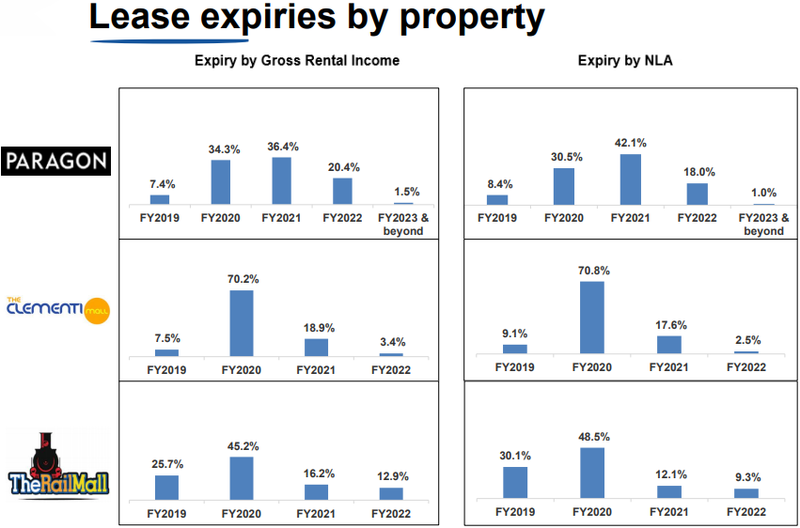 The rental reversions for Paragon had been on a decline in FY2018. Just before the results announcement, SPH REIT also announced in mid-December 2018 that it had also completed the acquisition of 85% interest in Figtree Grove Shopping Centre in New South Wales, Australia (Figtree). Based on the announcements from SPH REIT, the acquisition of Figtree is expected to be DPU accretive – expected to boost Q2-2019 DPU. Here in this article, we look at how both these positive rental reversions and acquisition could potentially bolster SPH REIT’s FY2019 results. 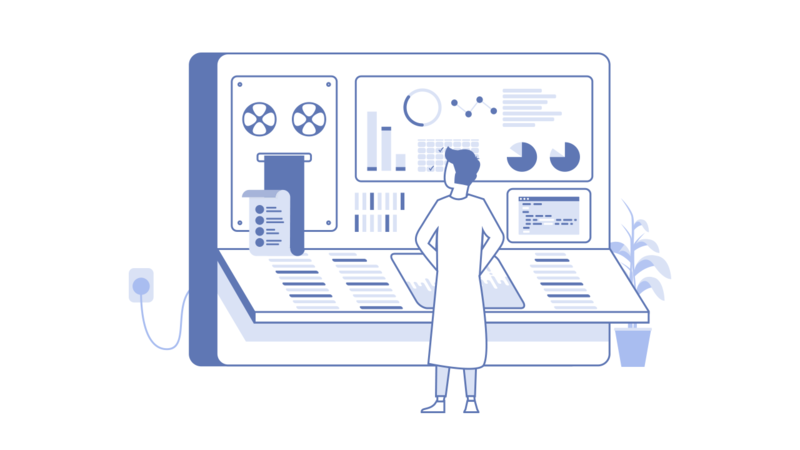 Looking at the highlights of Q1-2019, results had be pretty flattish. This is despite the addition of The Rail Mall which was acquired in Jun-2018. 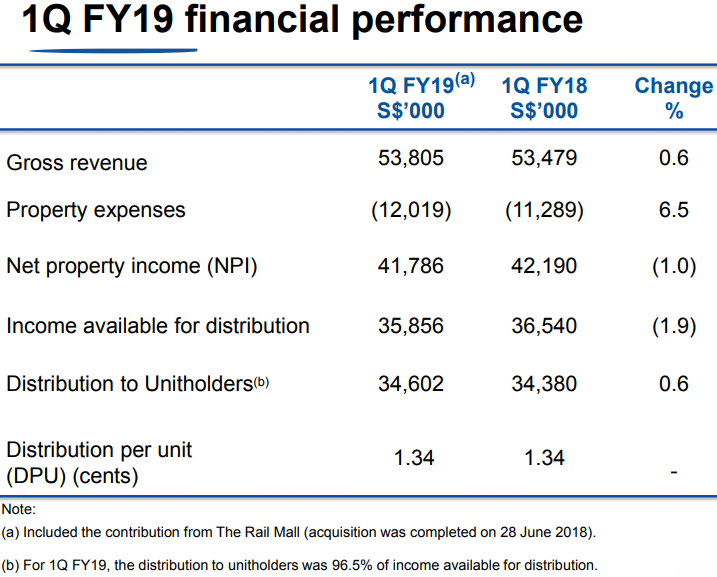 The additional $1.0mil increase in net property income due to the addition of The Rail Mall was offset by the decline in net property income for Paragon by $1.4mil. Performance of Clementi Mall was stable. Its debt maturity profile has been fairly evenly distributed with no more than 35% of its debt expiring in a single year. This helps to distribute its risk should there be any unfavourable interest rate conditions going forward. Its average cost of debt has also declined from 2.85% in August-2018 to 2.80% in November-2018. Gearing is fairly low at 26.3% but this is expected to increase to approximately 30.0% post-acquisition of Figtree. 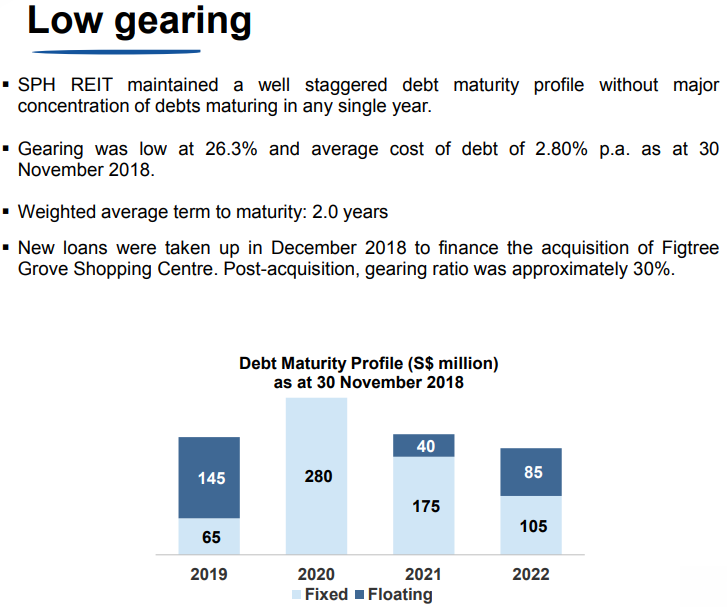 Given that its total assets of $3,407.5mil, a 30.0% gearing would still give SPH REIT a debt headroom of approximately $500mil or 15% of assets. This is still very large and could be utilised for sizable and significant acquisitions going forward. There is a slight concentration risk as about 41.2% of its gross rental is expected to expire in FY2020. Should there be adverse economic situation that occurs during this year, a significant portion of the lease renewals could be impacted. The rental reversion for Paragon Mall in FY2017 and FY2018 had been negative. However, Q1-2019 turned in an unexpected positive rental reversion 10.1%. 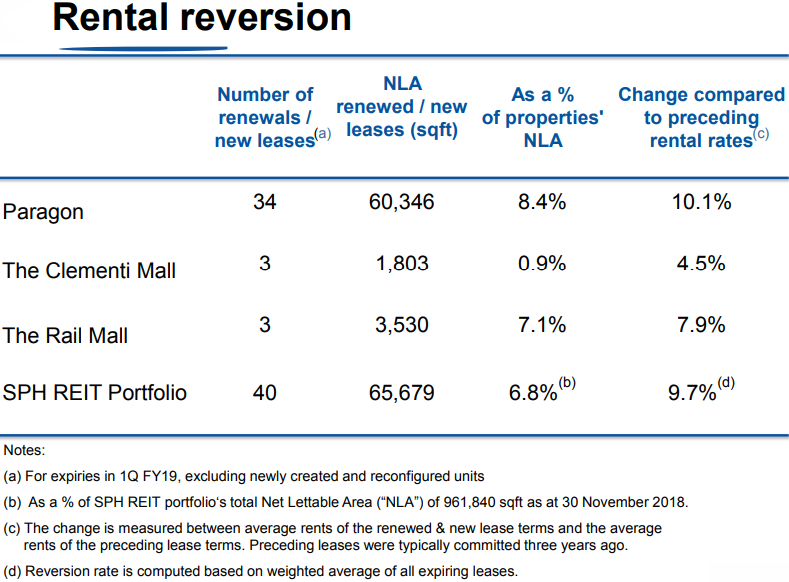 Together with positive rental reversions from both The Rail Mall and Clementi Mall, the overall rental reversion for the portfolio was 9.7%. In order to estimate the impact of this rental reversion on its DPU accretion, we will need to estimate the impact on the gross rentals from the percentage of NLA renewals. 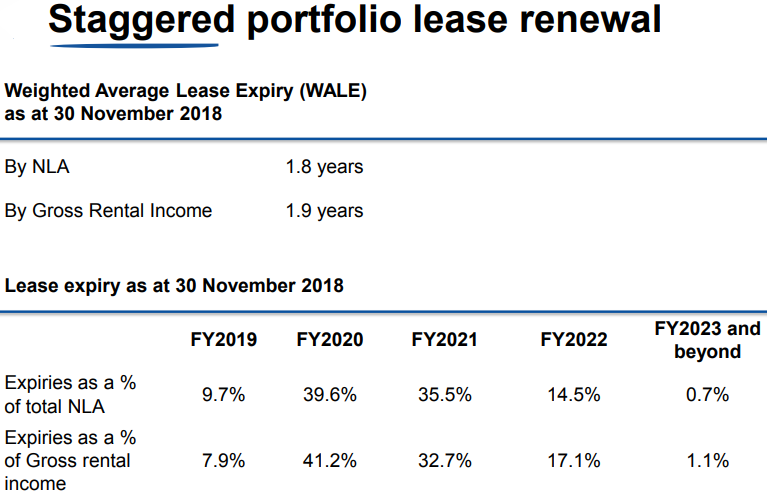 Fortunately, SPH REIT has provided this equivalent in their presentation slides and we will take an assumption of a liner proportional on the conversion. We will also assume that besides the rental reversion impact, all else remains constant throughout FY2019. Based on the available numbers above, we estimate that the gross rental income would increase by $324.4k next quarter due to the rental reversion. This results in the gross rental income to grow to $54.13mil from $53.8mil. Assuming that expenses will also increase proportionally throughout 2019, taking a simple ratio, we estimate that the net property income and distributable income would grow to $42.0mil and $34.8mil, up from the current $41.8mil and $34.6mil. 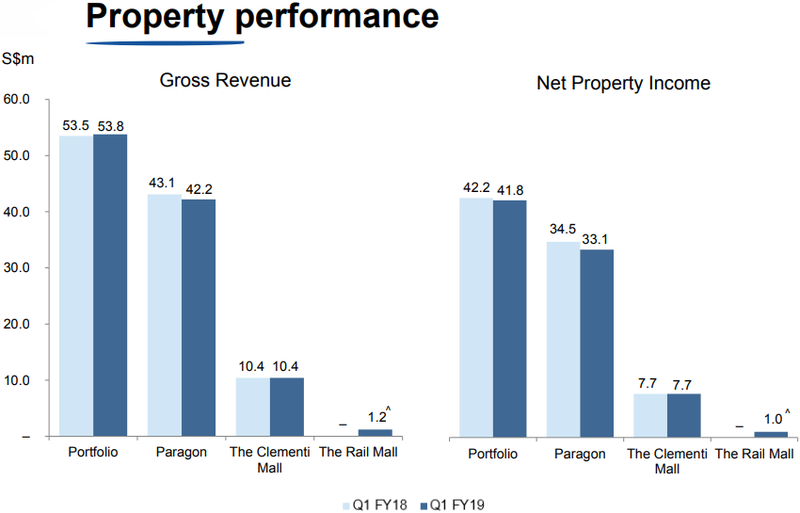 As we are aware that in FY2019, SPH REIT pays out 100% of its management fees in units, we need to also take into account the growth in units next quarter. Therefore taking the diluted units in issue announced in Q1-2019 from 2,582.226mil to 2,586.478mil – an increase in 4.252mil units. As a result, we estimate that DPU could potentially grow organically by 0.006c for each quarter assuming all else remains constant. SPH REIT will be acquiring an 85% stake in an Australia asset known as Figtree Grove Shopping Centre for a consideration of A$206.6mil. SPH REIT’s 85% contribution to the consideration would be approximately A$175.1mil. Given that the net property income is expected to increase by A$10.46mil due to this acquisition, SPH REIT is acquiring Figtree at a NPI Yield of 5.97%. This is approximately 1.0% higher that its current annualised portfolio NPI Yield of 4.96%. After taking into account the total acquisition cost, the NPI Yield is approximately 5.7%. This assumes the exchange rate between AUD to SGD is 1-to-1. The asset will come attached with a rental guarantee of up to A$800,000 for the first 12-months. It is not entirely clear what the rationale is for the rental guarantee; SPH REIT loosely mentioned that it is to “cover the shortfall per agreed tenancy between guaranteed gross rent for the tenancy and the rental actually received” “in respect of the specified premises and the gross income or gross rent budgeted by the Seller”. The acquisition is expected to be financed through a combination of debt and internal sources. 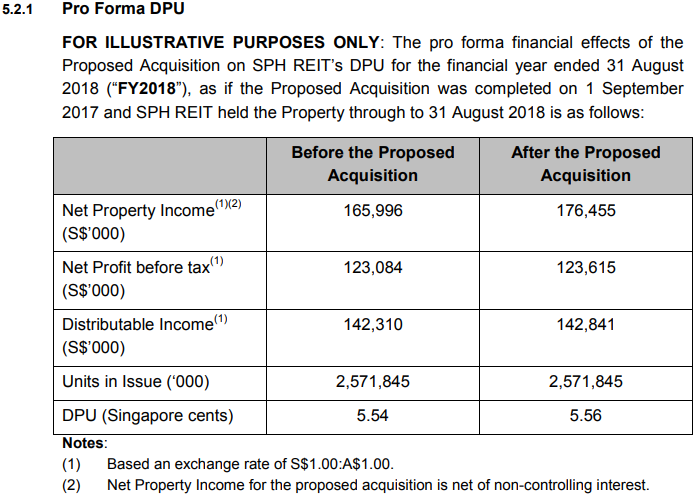 Estimating the DPU accretion due to the Australian Acquisition is remarkably easier as SPH REIT has provided investors with a pro forma impact on the distributable income. Based on SPH REIT’s announcement, the pro forma difference in distributable income works out to be a difference of $531k over a year or $132.8k over a quarter. This assumes that the SGD and AUD exchange rate is one-to-one and all other factors being equal. Using the same units in issue, we obtain a 0.005c accretion for one quarter assuming all else remains constant. Adding this to the estimated accretion in the previous section, we obtain a total DPU accretion of 0.011c. 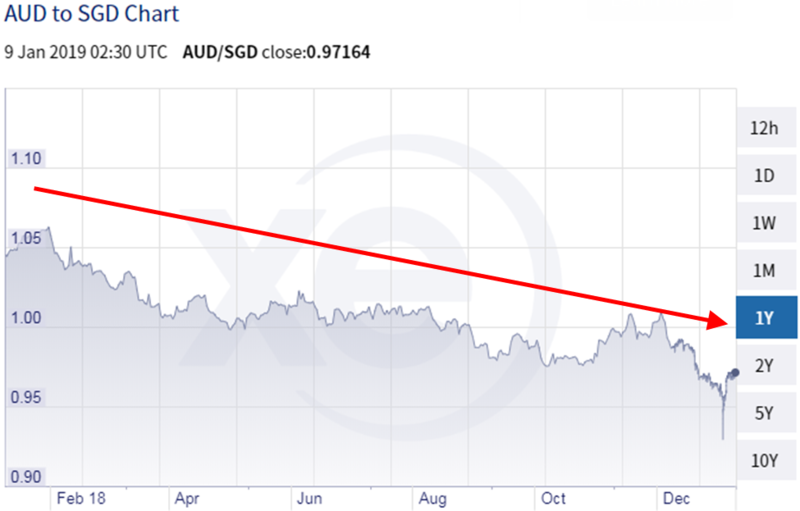 Over the past 1 year, the AUD has been gradually weakening against most major currencies include the Singapore Dollar. At the time of writing, is has weaken to 0.9716 against the SGD. As the pro forma results provided by SPH is based on the exchange rate of 1-to-1, we will discount our estimation by 0.001c due to the weakening AUD. This gives us an estimated accretion of 0.010c. Looking at SPH REIT’s historical DPU trend since FY2015, it is clear that its DPU shows seasonality trends. Therefore, we will assume that its past FY2018 performance remains similar with a 0.01c accretion applied consistently throughout FY2019 to account for both the positive rental reversion and Australian acquisition. Applying our estimates from above, we obtain a total forward projection of 5.57c for FY2019. At the point of writing, SPH REIT’s share price closed the week at $1.03. Based on our projection we estimate that SPH REIT’s forward yield is approximately 5.41%. 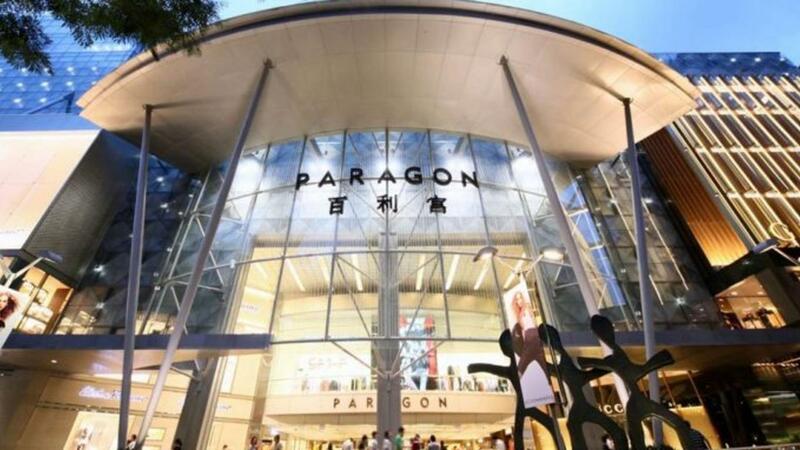 We are happy to see that SPH REIT has finally turned in positive rental reversions from Paragon Mall after 2 years negative reversion. In addition, we are also positive about its recent DPU accretive acquisition in Australia. We think that the management action is aligned with unitholders by capitalising on the weak Australian Dollar to acquire DPU accretive Australian assets. Income support for Clementi Mall has also expired; it remains to be seen if Clementi Mall rentals can continue to show consistent and positive rental reversions that will increase its overall gross rental. We will need to monitor SPH REIT in the coming quarters and track our estimates against the actual results. Should there be material changes, the estimates need to be adjusted accordingly. We caution readers to take these estimates only as a guide and should not be relied upon exclusively. Readers are advised to perform their own independent due diligence before investing.